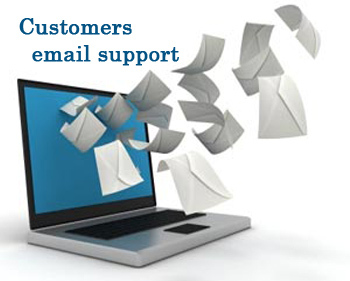 Email customer support is considered best medium to develop lasting relationship with customers. In spite of its importance in customer care, it is often neglected by several companies from different sectors. As per several reports, it is often observed that email queries are either responded extremely late or with wrong answers. Customers lose the trust in the company if they face these kinds of situations. Therefore, it is essential to provide finest form of customer support through email to maintain trust of customers. Companies can also outsource email support to receive expertise of seasoned agents at reasonable prices. Here are some essential benefits associated with email customer care support. Several responses related to customer queries require attachment of files that help in providing solution for the complaint or doubts. Email support agents can also include screenshots that allow the customers to understand the resolution in a better form. Some screenshots also allow the customers to perform several functions themselves using the company’s website or some resources. As per statistics portal Statista, number of smartphone users in 2016 will be around 2.08 billion. Majority of these users utilize the email function of smartphone to read or write mails. These users are able to send their queries or complaints to the brands using emails on their smart devices easily and quickly. Also, they can view the response from the company’s brand by reading email on these devices even if they are travelling or located on some other part of the world (if that area has an internet connection). Every smart firm in today’s competitive climate understands the vitality of customer satisfaction surveys. Email acts as most efficient medium to send surveys to the customers after providing the customer support. This medium is most effective one even if the support was offered from another channel like phone or live chat etc. Companies need to take special care of busy customers as they get frustrated if they have to wait in queues while calling the customer support. 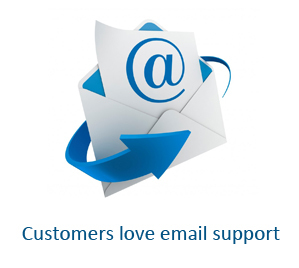 The email support acts as boon for companies to handle this segment of customers. The busy customers can quickly type their emails and send it without wasting unnecessary time. People tend to trust the things which are in written form due to some level of authority associated with it. Customers give importance to email as medium of posting queries and complaints as they feel that the company will take them more seriously. Also, the emails as act as written record for customers who can use them during disputes that might occur with the company in the future. Companies can easily outsource their email support in integration with phone support as the process does not cost a fortune. The returns on investment (ROI) are usually quite high that makes the process economically effective for the firms. In social media channels like Facebook and Twitter, the query and its response is generally visible to the common public. Several customers do not prefer to discuss their issues or queries openly due to multiple reasons. For all these customers, email can be the great source to discuss the issues disclosing them in public. Using emails, customers are able to describe their issues in comprehensive manner with inclusion of all necessary points associated with their query. This is usually not possible in mediums like phone where several customers find it difficult to describe their issue with full details. Just like the queries, the responses from the company’s end are also provided with complete details. This ensures customers are completely satisfied and tend to return to the company to purchasing product/service in the future. While responding to a query on email, agents can offer recommendations to the customers related to the product/service previously purchased by the customer. This will add more sales in the account of company if done strategically. Several potential customers mail their doubts before purchasing a product/service. In these cases, agents can provide detailed answer containing benefits and features along with images that can influence customers to purchase the product. This will another benefit associated with sales point of view. Each benefit discussed above can be achieved by companies if email support is handled carefully by the customer support experts. Several call center vendors offer email support outsourcing services which ensures that customers are handled with care for long term loyalty.